All countries of East-central Europe are members of the EU. Central Europe has experienced great upheavals with the coming of the Magyars. Powerful nations are emerging in Central Europe. The union of Poles and Lithuanians under one crown creates a huge dual kingdom. Much of Central Europe is threatened by the Ottoman Turks. Much of Central Europe is now divided between Austria and Prussia. All of Central Europe is now divided between Russia, Austria and Prussia. 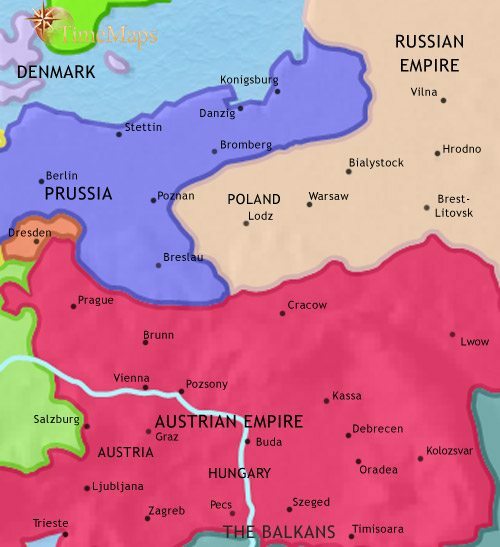 Central Europe is divided between the Russian, Austro-Hungarian and German empires. Central Europe remains divided between the Russian, Austro-Hungarian and German empires. Eastern-central Europe is divided amongst several countries, most now under Soviet control. In Czechoslovakia, a liberal communist regime came to power in 1968, led by Alexander Dubcek. This was seen as a threat by the Soviet Union, which sent in her army to replace it. Communist control of Czechoslovakia, Hungary and Poland lasted for another twenty-one years. Opposition movements grew in popularity and confidence, however. Then, quite suddenly, in 1989 the Communist regimes in all these countries fell. Each of them turned themselves into multi-party democracies, and, after initial adjustments, their economies began expanding. The people of Czechoslovakia decided to split their country apart into The Czech Republic in the west and Slovakia in the east (1993) – both remained parliamentary democracies. All this time Austria remained a stable and prosperous multi-party democracy. It joined the European Union (EU) in 1995. Poland, The Czech Republic and Hungary became members of NATO in 1999, and of the EU in 2004. The Avars submitted to Charlemagne, but their place as the dominant power in this region was taken by the Moravians. These were a Slav group, who organized themselves into a formidable state – known to history as Greater Moravia – over whom the Franks were able to exercise only a loose suzerainty. In the 860s and 870s, two Byzantine monks, Cyril and Methodius, brought Christianity to the Moravian lands. Although hailing from the Constantinople, the centre of the Orthodox Church, their missionary work in fact paved the way for the dominance of the Roman Church, at least in this region. The Moravians expanded their own control over a large territory, until their power was in turn destroyed by the Magyars. These were a horde of steppe peoples who, having been defeated by another group, the Patzinaks, on the river Don in 892, migrated to the central Hungarian plains. There they settled, driving out the Bulgars. From their base there they struck deep into western Europe on several occasions, spreading fear and destruction wherever they went. In 955, however, they were severely defeated by the German king Otto I at the battle of Lechfield. In the wake of this victory, Otto re-founds the Frankish Empire, which will become known to European history as the Hole Roman Empire. With the destruction of the Greater Moravian kingdom, one of their leading vassals, the prince of Bohemia, placed himself under the protection and suzerainty of the king of Germany. To the north, Poland has been organized as a Christian principality under Miesko I (963-992), and is a dependent ally of the East Frankish emperor. Poland expanded at the expense of Bohemia and the Slav tribes to its north, particularly under its king Boleslaw the Brave (992-1025). Under Boleslaw and his successors, Poland gained a strong enough national identity to break free from the empire and seize the imperial territories of Moravia, Lusatia and Bohemia. 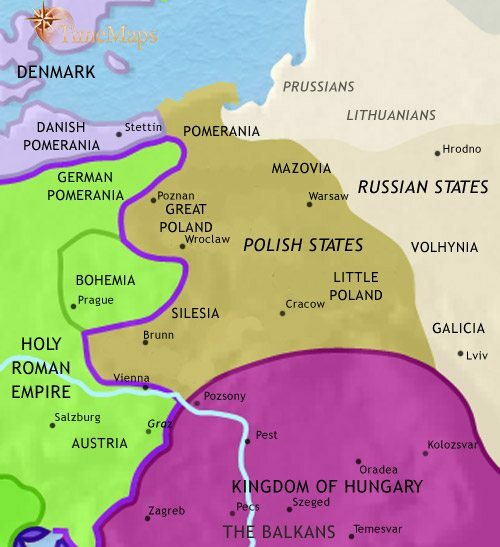 They soon lost most of these and, in the shifting pattern of frontiers in this region, Moravia became united with Bohemia (1029). Due to the Polish kings’ granting of territories to relatives and allies, Poland has by now fragmented into rival principalities. The principality of Bohemia has meanwhile been raised to the status of a kingdom, within the Holy Roman Empire (1198). Stephen I was crowned king of the Hungarians in 1000, marking the Christianization of the Magyars and the acceptance of Hungary into Christendom. The death of Stephen ushered in a period of political instability until Ladislas I (reigned 1077-95), who saw off a threat from the Cumans, another steppe people, and was one of Hungary’s greatest kings. He was followed by Coloman (1095-1116), another able ruler. Hungary then lapsed into political instability again, until Bella III came to the throne (reigned 1173-96). Under Bella, the Hungarians conquered the Cuman lands to the east. 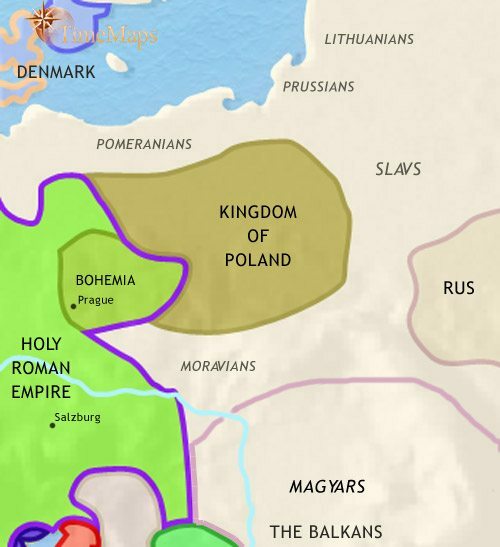 Poland was reunited in c. 1330, and its frontiers expanded again. In 1386, the Polish and Lithuanian royal families became united in marriage, and the two countries have since been ruled by one monarch, with the pagan Lithuanians agreeing to accept Catholicism. Poland-Lithuania inflicted a bloody defeat on the Teutonic Knights at Tannenburg (1410), who ceased to offer much of a threat after that. In Hungary, in 1242, a powerful Mongol invasion left a devastated country with half the population dead. In the following century, the monarchy passed by marriage to the powerful Luxembourg family, who were also kings of Bohemia and Holy Roman Emperors. Since the late 14th century warfare between Hungary and the Ottoman empire has become endemic. In Bohemia, a religious movement known as the Hussites won support at all levels of society. They rebelled (1419) against the king, and were only with difficulty subdued, and only after a compromise which established an autonomous Bohemian Church within the Catholic Church. In the mid-14th century, at a time of great disorder within the Holy Roman Empire, a local magnate, Rudolf of Hapsburg, secured control of Styria and Austria as hereditary duke. His descendant, Albert II of Hapsburg, has been elected Holy Roman Emperor. The Hapsburg family will fill this office, with one short break, until the end of the empire itself (in the 19th century). The Hapsburg family has become a European power in its own right. By an extraordinary sequence of dynastic accidents, they have become kings of Bohemia and of Hungary, as well as virtually hereditary Holy Roman emperors. 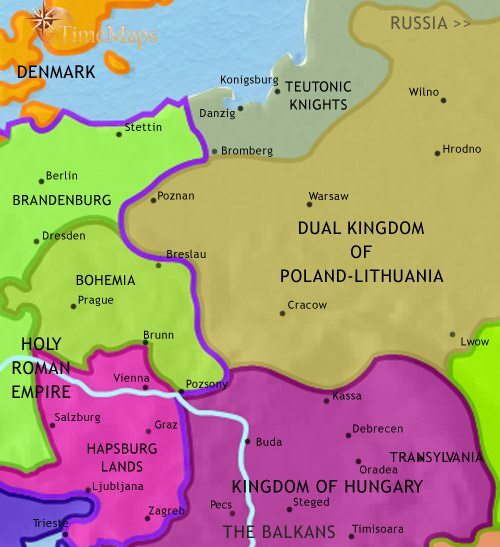 In the mid-15th century Poland-Lithuania reduced the Teutonic Knights to vassal status, and the country became one of the greatest powers of Europe. However, a new danger was gathering on her eastern frontier as a newly-powerful Russia started her expansionism. Soon Poland-Lithuania was at almost continual war with Russia, and having to concede large amounts of territory. In 1569 the Polish-Lithuanian nobles agreed to elect a joint king. This agreement has led to the elections of foreign kings, who have left the nobles a large measure of independence but have involved Poland-Lithuania in constant wars with her neighbours. To the south, Hungary faced a growing threat from the Ottoman empire. The death of king Louis at the battle of Mohacs (1526) left a political vacuum, which the Hapsburg family eventually filled. By that time, however, the Ottomans had conquered much of the country. The eastern part, Transylvania, had become a client state of the Ottomans. In the lands of the Hapsburgs, the Catholic Counter-Reformation against Protestantism was actively (and in many cases successfully) pursued. In Bohemia, this led to open revolt by the Protestants, which sparked off the terrible Thirty Years War in Europe. Wars with its neighbours to north and east, coupled by internal revolt, devastated Poland-Lithuania. In the north, the ruler of a German state, Brandenburg, was able to win recognition as the independent duke of Prussia, no longer holding it as a fief of the Polish crown. This territory has formed a major element within the emerging kingdom of Prussia, which itself now poses a direct threat to Poland’s security. Poland is now ruled by Stanislaw II Augustus (1764-95), under whom the neighbouring powers of Prussia, Russia and Austria have taken large chunks of the kingdom in a move known as “The First Partition of Poland” (1772). The Partition has shocked the Polish ruling class out of its complacency and, under Stanislaw, a raft of political, administrative and educational reforms are being carried through, as well as far-reaching economic measures. The Ottoman empire has posed a grave threat in central Europe, but failed twice to capture the Hapsburg capital of Vienna (1529 and 1683). The failure of the second siege put the Ottomans on the defensive, and by 1699 the Hapsburgs had cleared the Turks from Hungary. Transylvania was reabsorbed into the newly liberated Hungary. Maria-Theresa ascended the Hapsburg throne in 1740 and was immediately engulfed by the War of Austrian Succession (1740-8). Except for Silesia, however, which was captured by Prussia, she managed to hold on to her lands. Her son, Joseph II (1780-90), has enacted a series of far-reaching reforms, which threaten the privileges of entrenched groups and stir up a hornets’ nest of hostility. Joseph is forced to repeal many of his reforms before his death. The “First Partition of Poland” shook the Polish ruling class to its core, and, under king Stanislaw II, a raft of reforms were carried through – including the introduction of the first modern written constitution in Europe (1791), establishing a parliamentary monarchy. Disastrously, this provoked Prussia and Russia into the “Second Partition”, and in 1795 the “Third Partition” between Prussia, Russia and Austria wiped Poland off the map as an independent state. The whole of central Europe was caught up in the maelstrom of the Revolutionary and Napoleonic Wars between 1789 and 1815. In 1806, the Holy Roman Empire was abolished, and the Hapsburg domains were re-designated the Austrian Empire. Austria emerged from the long wars as one of the leading European powers. During the wars, Poland briefly reappeared as the Grand Duchy of Warsaw, under French control. In the 1815 settlement, Poland was reconstituted as a kingdom, but under firm Russian control. An uprising by the Poles was put down by the Russians (1830), who then began carrying out a policy of Russification. In the Austrian Empire, the end of the war saw the chancellor, Metternich, very much in the driving seat. He has set about creating, both within the empire and throughout Europe, a conservative climate that seeks to preserve traditional authority and check revolutionary movements. In Hungary, there have been widespread calls for social and political reform since 1815, but to little effect. Following the Polish uprising of 1830, the Russians pursued a policy of Russification. This led to repeated and widespread uprisings, put down after bitter fighting. Eventually the Russians put an end to Poland as a separate state (1863). In 1848, inspired by the Paris Revolution of that year, the Bohemians, Moravians and, most notably, the Hungarians under Lajos Kossuth, rose in revolt against the Austrians. In Hungary this was only put down after bitter fighting, and with the help of Russian forces. A repressive regime was imposed throughout these Hapsburg lands. Austria’s defeat in Italy in 1859 delivered a further shock to the Austrian monarchy, and resulted in greater liberalization within the empire. An even more shocking defeat at the hands of Prussia in 1866 led the Austrian government to recognize complete equality between Austria and Hungary, and political autonomy for Hungary. The Austrian Empire has been renamed the Austro-Hungarian Empire (1867) and, in both countries, democratically-elected parliaments are given a much more central role. The Austro-Hungarian government has been increasingly interested in extending its influence in the Balkans, where it has come up against the rival ambitions of Russia. The resulting tensions have triggered the First World War. Hungary is an equal partner with Austria in the Austro-Hungarian Empire. The remaining area about which the Hungarian elite feels resentment, is that German is the language of command in the Austro-Hungarian army. However, their wish to push this issue to its logical conclusion (separate armies for Austria and Hungary) has been muted by the emperor’s threat to introduce universal male suffrage, which would deliver political power into the hands of the Slav majority in the Hungarian part of the empire. Meanwhile, Poland remains absorbed within the Russian empire. 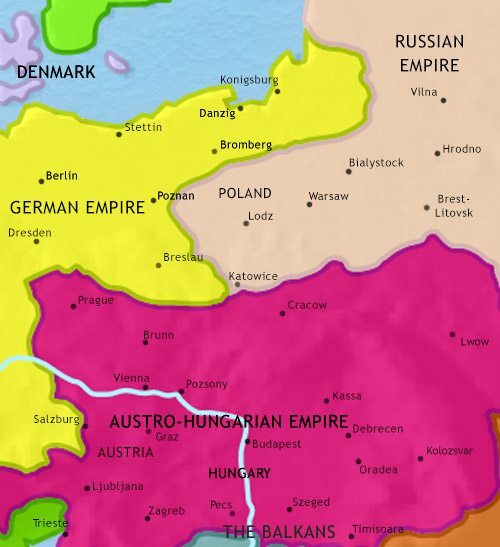 As one of the defeated powers of World War 1, the Austro-Hungarian empire was broken up and divided amongst several countries: Austria, Hungary, Czechoslovakia, and parts of Romania and Yugoslavia. Austria became a republic, whilst Hungary, which lost over half its territories, became a constitutional monarchy. Czechoslovakia was created by the merger of Bohemia, Moravia and Slovakia; it became a republic. To the north, Poland was re-established as an independent state. The new republic faced severe problems, which led to the setting up of a right-wing dictatorship in 1926. The whole region was left in ruins by World War 2. It was “liberated” from Nazi occupation by the Soviet army, which effectively became itself an occupying army. Communist Parties answering to Moscow took full control of Poland, Czechoslovakia and Hungary. This situation was formalized in the setting up of the Warsaw Pact in 1955, which tied these countries to the Soviet Union. Austria narrowly missed the same fate, but her government successfully steered her away from communism towards democracy and into the western camp. There is considerable opposition to the Communist regime amongst the peoples of Central Europe. In Hungary, this boiled over into outright revolt in 1956, which was crushed by a Soviet invasion.